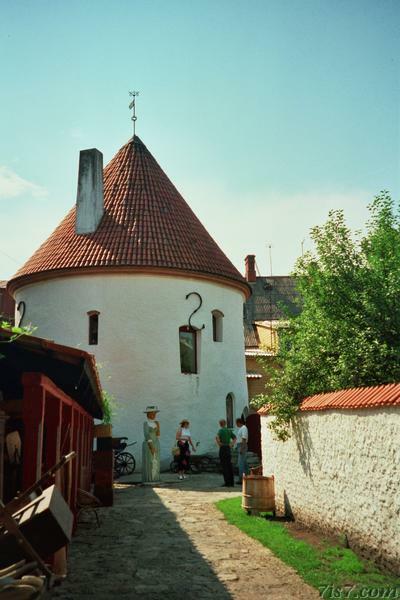 The Pärnu Punane Torn (Red Tower) is the only remaining tower of the former city wall and is the oldest building in Pärnu. The most striking feature of the Red Tower is that it is not red, the name was derived from the fact that the tower was lined with red bricks. I made this photo in 1997 but only published it online in 2009... sometime things take more time ;-) Although I made more recent pictures, this one still turned out somewhat better. Location: 58°23'6"N 24°30'10"E on: Google Maps, OpenStreetMap, Maa Amet.